This post has proved to be one of the most popular ones on this blog, drawing thousands and thousands of visitors or so each year. I suspect that there are a lot of churches putting on Passion plays and they’re looking for some guidance on this topic. This year, to enhance the service that this post has evidently provided, I have written a number of other essays that are meant to corroborate various claims made within the post. This post, and these essays, is available as an ebook. Use the menu at the end of this post to access the additional essays. Sometimes apologetics is about sifting out traditional accretions that in themselves are generally harmless but conspire to create a false picture. When Christianity comes to be evaluated, it is this false picture that is attacked, unmindful of the aforementioned accretions. This is sad, because virtually any Christian who has taken the time to familiarize himself with the actual facts of the faith is aware of what are accretions and what are not, but this doesn’t usually filter down. As a case in point, consider the cherished traditional presentation of the birth of Jesus, what with the ‘three wise men’ coming to greet the newly born King of the Jews. Upon examination, however, we learn that we are never told that there are three, that they came a couple of years later, and rather than ‘wise’ men they are ‘magi.’ The traditional presentation is harmless in the sense of conveying a certain tone during Christmas time but can be harmful, like for example when the skeptics get out their long knives and begin their hunt for biblical contradictions. I use the ‘three wise men’ as an illustration of the idea but the example that I mean to dwell on in this post has implications that more seriously affect our perception of the Christian message, or more precisely, the veracity of it and the robustness of the claim that it is supported by the evidence of history. Now, who cares? That is your next question. Or, if you are a hard nosed cynic you’ll go looking for pictures with more than two guards depicted as though this diminishes my general point. Let me state for the record that my problem is not with the depiction of only two guards, or three, but the general sense that at any rate, there were only a few guards at the tomb. I know, I know. You still want to know why it matters. Really, this example is just one of several ‘accretions’ we see in the Easter story but this one I mention because a failure to recognize the truth actually serves to undermine the Resurrection story itself. Consider the problem that the empty tomb presents in the context of this example. If historically we are quite certain that Jesus was dead, was placed in the tomb, and that several days later the tomb was assuredly empty, we begin searching for explanations other than a resurrection. Matthew itself presents the explanation that the guards fell asleep and the disciples snuck in and stole Jesus’ body. (Note that this explanation assumes the tomb is empty and that Jesus’ body is missing). Such an explanation is much more plausible if there are only two guards present at the tomb instead of, say, 16, 20, 40, 60, or more. If that many were on duty it becomes hard to fathom how the kidnapping of Jesus’ body could be done without being noticed. Now, the text definitely makes it clear that there were more than two guards. This is clear enough from a reading of Matthew 28 which says that ‘some of the guards went into the city and reported to the chief priests [what] had happened.’ Clearly, ‘some’ of the guards means that others remained while others- not “one of the guards'” but “some of the guards” went into the city. For this to work it seems to me you’d need at least four guards. If these are in fact Roman guards, then four is in fact the minimum that protocol would dictate (see for example John 19:23), with each man taking three hours out of the night. Earlier in the account of Jesus’ punishment, we already got a glimpse of this basic ‘squad’ unit, when we read in John that the soldiers divided his garments “into four parts, one part for each soldier” (John 19:23). So, not two. At the extremely conservative, bare minimum, we must say at least four. Pilate responds with “Take a Guard.” Although there is ambiguity here in the Greek, I believe the context affirms that reading, meaning Roman soldiers were dispatched. Please keep in mind that by ‘a guard’ it would be like saying a ‘squad,’ where the singular implies a plurality. Eg, if he had said “Take a Legion” we wouldn’t foolishly believe Pilate appointed just one man. Pilate then tells them to make the tomb as ‘secure as they know how.’ How many guards might we imagine they would decide to send if they were afraid of Jesus’ disciples stealing the body? Well, at the minimum, you know there are 11 disciples out there, so I imagine if you are trying to thwart them that you would have at least as many soldiers as you had people you feared were coming. If you had half a brain (and I believe the Romans did in such affairs) you would send twice or thrice the amount. If you said twenty Roman guards here I think that would be a conservative but safe estimate. I highly doubt too that the Pharisees wouldn’t have some of their own temple guards on site, as well. (Who better to suggest to the Roman guards to go explain the matter to the chief priests rather than go back to Pilate and be put to death for letting a dead prisoner escape? See Acts 12:19). If I were them, I’d trust Pilate as much as I trusted the disciples. I’d want some of my own men around. One of the other often forgotten dimensions is that this all occurred during the Passover, when Jerusalem becomes flooded with pilgrims. There are so many that they certainly cannot all fit inside the city walls. The hills are likely packed with people camping out (and since they are all dressed the same in accordance with purification rites, you see the need for Judas to lead the way and then kiss Jesus). Just a few days earlier all of Jerusalem was singing ‘Hosannah!’ as Jesus entered the city. In other words, the Romans and chief priests both knew that Jesus didn’t have only 11 disciples, but 11,000. Or more. How many guards would you send? Now we see coming into focus why when the facts roll in it becomes really difficult to believe the story that was circulated that Jesus’ body was stolen. There were probably dozens of guards about. Even if sleeping the guards would have heard something. Rolling a heavy stone away (remember the women wondered how it was going to be done) would have required lots of grunting and probably the use of some tools. This is not a quiet endeavor. Then the disciples would have to slip away- with everyone of the guards remaining fast asleep- and not be spotted by any of the thousands of people camped out in the hillside. Imagine going to a July 4th festival and smuggling a dead body out without being spotted by anyone. So it becomes more important than we may have realized to understand the real situation of the moment. It was the Passover. There were hundreds of thousands of pilgrims in town. Many of these were fans of Jesus. The Romans knew this. The Chief Priests knew this. They would have posted guards proportional to the perceived threat. How many? I am not going to get bogged down into trying to give a firm number. The Greek word here ‘custodian’ seems to have a variety of uses and may or may not refer to a specific Roman military unit. In Acts 12:4 Herod dispatches “four squads of four soldiers each” to guard one man, Peter. If it was perceived that sixteen men were needed to watch just one of the disciples one can only guess how many they thought were necessary to guard against a minimum of eleven. If pressed, I personally suspect that thirty to fifty guards were present but even if there were only sixteen (per the Acts 12:4 model) it is virtually impossible to believe, seriously, that they all fell asleep and remained so as a bunch of disciples were slinking about, clawing at a honking big tombstone, and then extracting the body. We are talking about Roman soldiers here, after all. These sorts of considerations don’t enter our minds, however, when we don’t take the time to acquaint ourselves with the actual facts and assume that tradition was always concerned with precision. In this case, the traditional presentation, if believed, aids in undermining our confidence in the resurrection account while a close familiarity with the text and context achieves the opposite. I do enjoy this somewhat fanciful notion that believers have in trying to couch their apologetic arguments under the unbrella of “facts”, as if in so doing they automatically win whatever argument is undertaken. This guard discussion seems to be one of those and since the “facts” appear to be on the menu, let’s look at a few more “facts” that are often forgotten. Fact 1–scripture records that the stone placed in front of the tomb was put there by Joseph of Arimathea by himself. At least no reference is given to anyone assisting him. Shall we call this a fact? According to scripture it would be. Fact 2–it is stated in Matthew that the guard, however many that might have been, was not placed by the tomb until the day after Jesus was buried. That means the tomb was unguarded for the first night and some of the second day. If nothing else, it certainly creates an interesting scenario for what might have happened. Aren’t these fact finding missions fun? As Joe Friday used to say, “Just the facts, just the facts.” Anyone interested in further correspondence can e-mail me. If you are a believer or an aplogist, however, it could make you very uncomfortable, if the “facts” scare you. On the other hand, it might prove educational and exciting. Thanks for your comments. Unfortunately, I don’t think they accomplished what you think it did. I will point out that I did not forget these ‘facts’ at all but in my defense was focusing on one narrow point of interest. I don’t think that can be held against me. Now, I am quite willing to concede your facts. Let’s begin with Fact 2, first of all. It certainly is the case that the tomb was unguarded for a portion of the day. This only poses a problem if we are willing to assume that the guards wouldn’t have bothered to ensure that the body was still there once they arrived on site. Frankly, I find it absurd to suppose that guards would be dispatched to make sure a body was not stolen but wouldn’t first check to make sure it wasn’t already gone. Of course it doesn’t state that the guards did check but it doesn’t state that they didn’t, either. I am inclined to think that trained Roman guards wouldn’t dare place their seal without ensuring the body was still there. You are welcome to believe otherwise- but in my view it would be believing an absurdity. I could tackle that ‘fact’ on a number of levels but I think that will do. As to your first fact, it is true that the tomb is reported as being placed by Joseph alone. What is your point? That if one man could close it one man could open it? That seems like a desperate stretch in my book. The text clearly states that it wasn’t merely Joseph’s tomb, but that it was a new one. Hence, it was probably already open when Joseph came to it. The text clearly says that a big stone was rolled into place in full view of the women. The stone must have been sizable enough since the women later on are concerned about who will move it for them. Based on this description and on archeological discoveries of the types of tombs from this period, it becomes evident that closing the tomb was probably much easier than opening it. The stone would have been propped up with a wedge. When the wedge was removed it would have rolled into a prepared groove so that the stone fell down and back so that the tomb was sealed tight. There were other kinds of tombs during the period but the description of the stone as being ‘rolled’ indicates with good certainty which one was used here. As tombs of this sort have been found, it is not conjecture in the slightest to see how one man alone could have closed the tomb but that several men might have been necessary to open it. Thom, you did not me uncomfortable in the least. You see what you want to see which is why you are blind. No Jesus = no accountability = life on Our terms rather than God’s. They were going to see that the body was not stolen. They absolutely would have checked to see that it had not been. They made the grave secure AND THEN set a seal on the stone. So they did things that they considered to be making the grave secure AND THEN set the seal. So the stone had not been sealed when they got there; and the 3 hour darkness, earthquake and tearing of the veil of the temple had likely REALLY gotten their attention. I don’t think they were there to keep thieves out, but remembering Lazarus were there to keep Jesus in. There can be NO doubt that they knew Jesus was still in the tomb before they left it under the Roman guard. I am a Christian and fully believe the Bible. However, in regards to Jesus’ tomb, I have a few questions. 1.The version in Matthews regarding the events that took place when the women arrived at the tomb, is different to the other three gospels in that the stone was rolled back by an angel. If we accept the other three versions that state that the stone was already rolled back when the women arrived, how did this occur without the guards being aware of this? I mean, assuming that they all weren’t drunk and asleep and were awake at the time, were they standing there watching this big stone move by itself? Or did the stone during the night just move suddenly and silently without anyone noticing? I assume this scenario wouldn’t have occurred as even if only ONE guard was awake and on duty, he would have seen it, and if so, why didn’t he raise the alarm before the women arrived? How do you see the rolling back of the stone taking place? Of course, even if the body was stolen, which will always be debated, it doesn’t account for Jesus miraculously appearing to around 500 people at the same time, plus to some of the disciples individually. Picking up on Rosie’s point,if the disciples did somehow manage to steal the body, why would they create the resurrection story and then willingly die martyrs deaths knowing it was a lie? Why didn’t the Jews and Romans, once word had gone out that the body was stolen or missing, immediately arrest and interrogate each known disciple and follower that was in Jerusalem that weekend? Josephus and Tacitus surely would have written about an investigation or arrest had it occurred, but it obviously did not happen. The disciples were methodically hunted down and killed later on after Christ’s post resurrection appearances and during the time the church started to grow after Pentecost. Thom Waters: here’s another inconvenient fact for you. You state the tomb was unguarded the first night, which is apparently true. However, the tomb was later “made secure” and “sealed” by the guard. At some point, someone had to sneak in, break the seal, and then roll back the stone in the presence of the guard. Why would they risk that if they had already stolen Jesus’ body the first night? Wouldn’t it make for a better story if they claimed Jesus rose from a secure, sealed tomb? The FACT that the tomb was opened in the presence of a guard adds to the validity of the Biblical account. Great article! I never thought about what must have transpired in the Roman centurion’s heart when he believed that Jesus was the Son of God. Then I thought that maybe this is the same centurion mentioned in the book of Acts. So I was doing a search on the roman soldiers and I came across this page. Thanks for more reasons for the hope. Okay Thom, let’s look at your statements. First, Joseph of Arimathea was not working alone, he had Nicodemus to assist him (John 19:39-42). Second, the Royal Praetorian guard consisted on soldiers, having no less than ten years combat experience – not your ordinary soldier. A guard consists of 16 soldiers for rotational duty. The tomb was sealed with the seal of Caesar and the penalty for unauthorized breaking of that seal is death. If the soldiers were in fact sleeping and the body stolen, the penalty is death. They would be stripped of their uniforms, tied to a stake and burned alive with their own clothes. That is why the chief priests had to bribe them with a significant amount of money to say they were asleep and the body was stolen and the governor would be bribed as well if the story reached him (Matthew 28:12-15). Third, the women saw the actual tomb where Jesus was laid (Matthew 27:61), so there was no mistake which tomb it was that held the body. Fourth, the stone weighs between one and two tons, and rolling the stone away from the opening of the tomb is something that can be done quietly, even if the soldiers had quite a bit of kool aid the night before. However, it is the fifth point that is the key. What did the women and disciples find in the tomb – the linen burial cloths at the foot and the head wrap folded at the head where Jesus was laid. When the body was prepared for burial by Joseph and Nicodemus, it was wrapped in the linen cloth and placed in the tomb (Luke 23:53). It would almost appear as a mummy would – wrapped in the linen cloth. Now think for a minute. What foolish person(s) would roll a one (to two) ton stone from the tomb (and not awake the guard – so they got that far) and say to the others, “hey, let’s unwrap the body before we take it away.” Do you remember what Jesus’ body looked like? Flesh hanging from the bone in the back, holes in His hands and feet and side, bloodied head from the thorns and the physical abuse from the soldiers who mocked Him. Nobody would EVER unwrap the body, much less have an easy time doing so, given the dried blood. In my opinion, the details of the Bible are significant in understanding what is happening. And, it is the smallest detail that holds a significant key to the actual account of the resurrection. The Lord also appeared to the women, the disciples and many others after that day, and I have enjoyed my own personal relationship with the risen Savior over the past 35 years. Thom, I hope you will discover Him too and let Him save you from your sins and give you eternal life. Thanks for this article! This one fact alone (that there were several guards at the grave) would be enough evidence for me of the resurrection of Jesus. It must have been a supernatural, powerful force that opened the tomb that morning and I can just imagine the fear those extremely well trained and disciplined Roman guards must have experienced which would cause them to leave their post (probably with the punishment of death hovering over them)! Jesus is LORD! He is indeed risen!!! 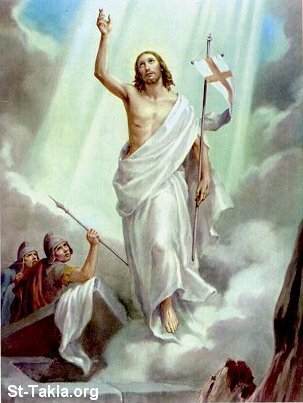 “BLESSED ARE THOSE WHO HAVE NOT SEEN AND BELIEVE” – JESUS (THE MESSIAH, RISEN SON OF GOD WHO WAS DEAD AND IS ALIVE SITTING AT THE RIGHT HAND OF GOD THE FATHER, WHO WAS AND IS AND YET TO COME BACK VERY SOON FOR HE HAS SHORTENED THESE LAST DAYS BECAUSE IF HE DIDN’T SHORTEN THEM NO FLESH WOULD BE SPARED! HE IS THE KING OF KINGS AND LORD OF LORDS! AND ALL EYES WILL SEE HIM AND ALL KNEES WILL BOW (including Thom) AND COFESS THAT JESUS IS GOD.) – Come quickly Lord Jesus! I just wanted to thank you for the article. I’m learning how to lead a youth group and wanted to talk about the rising of Christ, and your article really helped me find a historical standpoint to look at it with. So keep up the good work and let disciples be made! Thanks for the encouraging words, Rich! We, even today, in spite of our enlightened state, are very superstitious about and have morbid fears about dead bodies, even in daylight. In Jesus’ day this situation would have been compounded many times. But, let’s throw in some darkness! Now, we are told and it’s demanded that we believe that these women, travelling while it was yet dark, went (outside the city walls) to deal with a dead and buried, bloody and now stinking body (as far as they knew). The final point on the women is this. Jerusalem (Israel) was an occupied city/country. Women would not have risked wandering about needlessly in the dark when no one but soldiers of the occupying power would likely be around. And, where would they find five, ten, fifteen or twenty men before day break to move a tomb stone? My other poignant point is this. It is cited above, in effect, just how proficient the Roman soldiers were. If we agree on this point, then we surely correspondingly agree that a grave break, which Jesus is reported to have done, miraculous or otherwise, would have been immediately reported by these very proud and professional soldiers to their superiors. Remember, the Jewish leadership wanted Jesus dead, not running around eating fish. Accordingly, they would have supported the soldiers’ report of Jesus being missing. The last thing they (soldiers or Jews) would have done was seek to cover it up. The crowing laws for the Jews were the Ten Commandments, the first and foremost of which is: “Thou shall have no other god before me.” After some fifteen hundred years of this being their top law, Jesus comes along and, in effect, tells them otherwise. Simultaneously, He told them that He came along to uphold every tittle of the law. Yet, He, Jesus, being God, gave no indication that He realized that the Jews would have trouble with what He was asking them to believe. We, Christians came along and slaughtered Jews for not believing Jesus! Anyway, most Jews didn’t and still don’t buy Jesus’ account as to His identity. Accordingly, any report to the effect that He was seen walking around and talking and eating fish with folks would have been likewise immediately reported to Roman authorities. There was somebody walking around, whom the mighty Roman Empire couldn’t kill! Folks, I suggest to you that we would be reading of the repercussions yet today! Finally, as for the response of the disciples in that they reportedly stayed faithful to Jesus and eventually died for the cause, there is nothing new or unusual here. History is replete with accounts of adherents of other leaders, who did likewise. Furthermore, didn’t Jesus promise them wealth and riches in both this present life and the one to come? See Mk 10: 29-30. This is one of several prophesies, promises and pledges, which Jesus made that I can find no record of having come true. Yet, no one talks about it. Yet, if we would be intellectually and spiritually honest, we would ask ourselves: “Would God raise someone, whose ppps’ didn’t come true? Except for a few voices crying in the wilderness, I see no general tendency to be so honest. Additionally, we must remember that the disciples, when they gave up everything to follow Jesus, put their credibility on the line with themselves and their families, friends and neighbors. And, how do they ever face the all powerful (I told you so) Jewish religious leaders again? After three or four years, it would not have been easy for them to say that they were wrong. There is no indication that they didn’t have pride. thanks for the comment, Bigsky. Reckonings about ‘plausibilities’ are in my opinion typically too subjective to put forward as serious arguments. Real life is filled with ‘implausible’ events. Strictly speaking, the odds against any event happening are one in a trillion, and yet, things happen. The odds of winning the lottery are immense, yet people still do win. Moreover, plausibility arguments intrinsically speak to the unfathomable human mind: why do people do this rather than that? For a plausibility argument to have any weight, we must have good knowledge about a person and their character and their overall pattern of behavior. With close friends we may have such knowledge and can speak with confidence about what they may or may not do and why. With historical persons we typically only have the data the manuscripts provide, and if they are devoid of the rationale for an event, we must limit ourselves to that data. So you can see how ‘plausibility’ arguments can come from all sides with equal validity, and, as such, typically cannot advance or detract from our confidence in a historical retelling. I would put your assessment that the women would not dare walk the streets of Jerusalem in this same category. Again, we have to go with the data, and what did the data say? These very same women bravely witnessed the Roman execution of their friend, risking the possibility that they could be swept up into the same punishment. On that evidence, I’m inclined to think they’d have little trouble braving the Jerusalem streets at night. You say that Jesus showed no indication that the Jews would have trouble believing his claims. It is difficult to read the Gospels and not notice this tension. I will reference the one that came to my mind, John 14:11. Secondly, I agree that word would have gotten out to the Romans- we have textual evidence of exactly that, Acts 26:26 comes to mind. I think the evidence is clear that word certainly had gotten around that “There was somebody walking around, whom the mighty Roman Empire couldn’t kill!” How else to explain the huge number of conversions- mainly of Jews- at Pentacost, just fifty days later, right in the place the resurrection took place, Jerusalem? How else to explain that within 35-40 years there were so many Christians in Rome that Nero could find ‘multitudes’ to put on trial and burn to death? As for Jesus’ prophecy, you seem to overlook the most important of all of them- the destruction of Jerusalem. You’ll observe that none of the Gospels go on and say, “And this came to pass,” which they surely would have had they been written AFTER the destruction of Jerusalem. Finally, as for the response of the disciples in that they reportedly stayed faithful to Jesus and eventually died for the cause, there is nothing new or unusual here. History is replete with accounts of adherents of other leaders, who did likewise. Furthermore, didn’t Jesus promise them wealth and riches in both this present life and the one to come? … After three or four years, it would not have been easy for them to say that they were wrong. You are trying to have it both ways. You are right in noticing that history has known people who have died for their leader. In your last comment, you indicate that they would have been unwilling to admit that they were wrong and that pride goaded them on, but in the paragraph before you emphasized the fact that Jesus had promised them goodies in the present and afterlife. Now, if they knew that they were wrong, they would have also known that there were no goodies coming their way. You can’t argue against the validity of their actions both on the basis that they believed Jesus’ message and that they didn’t believe it. That is the same as no argument at all. But I will respond to both contradictory statements anyway. For the disciples to go and die on account of Jesus- on the basis that they actually believed him- then it follows that they, well, believed that he rose from the dead, as promised, and that there was a good reason to expect goodies. There is no ‘being ashamed of being wrong’ on this view, so we have to ask ourselves exactly why they thought they could expect goodies in the afterlife. Why would they think that if they just watched their leader get slaughtered? It should have been the end of that dream. Instead, it turned the world on its head, and continues to do so today. Your other notion, that they knew that they were wrong but were ashamed to admit it to their friends, families, and neighbors and face the Jewish leaders, I would have to hasten to the obvious point that there is a big difference between that kind of shame and actually dying. I can think of all sorts of mistakes I’ve made that I wouldn’t be particularly proud to acknowledge, but if you put a gun to my head I’m pretty sure I’d do it anyway. Remember, on this view, they know that they’re wrong- so now they go out to the four corners of the kingdom preaching a Gospel that they KNOW is a lie. They go hundreds and hundreds of miles away from their families, friends, and neighbors, and could just as easily melt into the local population but instead you’d have us believe they preach the thing they know is a lie? And then, when ordered to repudiate their message- in the assembly of strangers who don’t know them from Adam (and thus nobody to save face in front of)- died horrible deaths instead? I have pondered the aforementioned arguments and cases for quite some time. I don’t believe that there is one sole answer, but many answers to many questions. One theory that comes to mind is the burial of jesus in the tomb. Do we know where this tomb is today? One would think that if something this extraordinary happened it would be holy ground, Excuse my ignorance but is it still accessible? The Romans could have went to the tomb after the day or so that it was unguarded , realized the body was gone and did not have the courage to report it fearing they would be burned to the stake. They sealed the tomb not thinking that the jewish Senate would want it opened to show the people that he had not risen, after all they had to prove it or it would never end. When it was opened the perfect storm happened. The woman were amazed, several people flocked around, one thing lead to another and thus the Romans were off the hook and surely would not say anything different. There are too many situations that we do not know. For instance were the guards ordered to guard the tomb immediately? How far was the tomb from the crucifixion site? Did the Romans report to Pilate that the body was indeed gone when they started to guard Jesus, and Pilate did not want an uprising because he was already under tight scrutiny from ceasar so he ordered to have the tomb sealed. He then had to open it for the Senate who would have to prove Jesus did not rise thus the perfect storm theory again. I am sure we would all agree that the Senate would of wanted to show he did not rise. The tomb would have to be opened or no one could say he did or did not rise. Last but surely not least. The body was there when the tomb was sealed, the guards were approached by Joseph later and offered them a great sum of money to let them move the body. The story told in the bible was that the soldiers reported to the senate that an angel moved the stone and Jesus rose. The Romans were offered a great sum of money from the Senate which they took from the Senate. It seems that they could have made double bounty from this one. I find it hard to believe that if the soldiers did indeed see this miraculous divinity from an angel that they would take money in plight of a revelation such as this. One would also believe that it would be reported to the command and not the Senate. We must also remember that the new testament is Christian friendly and could tend to lean toward the biased opinion of such. This mystery will undoubtedly be researched and discussed for many years to come. I know Allegro is close to the truth because 5 dried grams of psilocybin in a quiet dark room alone at night will certainly give you a refreshing look at what was going on and being experienced by the Essene Sect who came up with the idea of the Friendly Carpenter, your views and ideas will most likely be changed for ever for the better….no matter what you think you believe right now . Great discussion. it is easy to see the mental, emotional and cognitive framework of those who have a relationship with Jesus and those who do not. As in any debate of the bible there will never be a clear winner as long as words are the focus. Words and the combination of words into phrases are vulnerable and susceptable to the author of them. As readers, we by default become authors, because our minds interpret the words and phrases according each indivual’s experience. At the rate of over 260,000 times per second our brains form new synaptic connections. The stimului that prompts these connectons is different for each person. The chemistry and biology of each person is unique to each person. A basic knowlege of probabilities reveals that each person will come up with slighty different variations of any one theme. It is no wonder then that Jesus was called the WORD, He was sovereign over the ability of men to create language and communicate. Only Jesus could show us the invisible, unique, eternal God whom he properly called His “Father”. The sequence of events (so aptly and fascinatingly) presented in this discussion were arranged by God to do just what they are doing in this discussion “turn the hearts of men toward their Creator and their Savior”. It is now wonder also that God sees as as “hard hearted”…we protect and defend our exisiting emotional and mental status yet He surrendered all of His status and yes…even His most valued relationship He willingly surrendered…that relationship of Father and Son…the flesh of God willing tearing apart from the heart and sould of God…the Son and Father break their eternal bond. the One God of the Old Testament becomes the One God of flesh, human spirit and Holy Spirit. God manifest in the flesh becomes allows the flesh to tear off of Himself, willingly to show us that we are not the creators of our own life and being, God created us and He will bring us back into that perfect relationship with Him. The torn body of Christ and the Eternal Spirit of God show us the plan. The One God becomes one flesh, the flesh is destroyed and returns again as a glorified body,The glorified body becomes the One body on One throne to be alone and sovereign over all of His creation. We are His companions, His Bride, His chosen…we will be His satisfying portion for eternity. Stumbled upon this site this morning and noticed that I had left a comment some two years ago. Interesting to see the responses that my short text had fostered. Too bad that pro-Christian documents are, for the most part, the only documents we have to work with when trying to unearth the truth to what happened so many years ago regarding certain events. 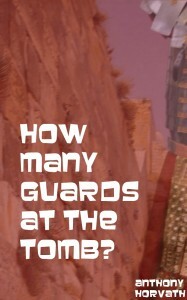 Having said that, it strikes me that the more compelling article you should have written is “Was there a guard at the tomb of Jesus?”, not “How many guards were there?” The article that you did write seems to presuppose that there actually was a guard. If you believe that, the question now becomes, “On what do you base this belief?” Since only Matthew records the guard story it seems that your historical documentation for accepting the story is somewhat thin, unless your position stems from accepting it because you find it in the Bible. Not much to discuss now, it would seem. If that’s the case, I suppose you accept the story in Matthew 27:51-53 as being also a historical record of some kind. Is this the case? Do you accept both the guard story and the story in Math 27:51-53? I suppose you do. If so, it seems to make further meaningful discussion somewhat difficult. They found Jesus’ Tomb, Crucifixion site and the Ark of the Covenant at the base of Skull Mountain. In regard to the question from Marty. Keep history in mind when trying to come up with questions. In 70AD Jerusalem was sacked by Rome. The temple completely destroyed. Jewish survivors taken into captivity and sold inot slavery in Rome. Along with the martyrdom of the Disciples … the witnesses are then removed, so the identity of the actual tomb becomes highly questionable. Also, Calvalry was next to the city landfill or trash heap. History tells of those crucified being thrown in the ditches around the hill, later to be devowered by wild dogs. Then a final purge of the Jews from Jerusalem during the invasions of the Muslims …. kinda removes proof of the actual route of Jesus through the streets, the location of Calvalry and the tomb …..
Next for Thom … Read Jewish history regarding Jesus. The Jews claim that there was a guard and that the followers of Jesus stole the body as claimed by the Priesthood. Your issue with fact must also include Roman Historians of the time. Historians that were not Pro-Christian as you suggest. Roman Guards were the equal of modern day Seal Teams, Green Beret etc. highly trained, exceptionally proficient. The Guard would have opened the tomb to verify the body within, rolled the stone back in place then sealed the tomb. This in itself is very important. The seal was a ball of wax pressed in place with the image of Ceasar pressed in the wax. One entity was assigned to guard the seal of Ceasar. A Roman Guard. Regarding the stone. One to two tons, rolled up a slight incline with a groove to nest the stone. The stone was easily held in place on the incline by a wedge stone. The wedge stone easily knocked out of it’s position in order to roll the stone in place. Temple Guard were most likely there as well. Mathew is not the only source as claimed. Pro Christian sources not the only historical evidence. Jewish History, hardly Pro Christian, tries to explain away the empty tomb. Further reading Corinthians specifically answers the resurrection. Biblical History has been proven to be the most accurate depiction of a people on earth. No other history compares in authenticy or accuracy. In 56AD Paul wrote about knowing most of the 500 witnesses, many of whom were still alive and knew the Disciples as well. The New Testament is not in chronological order. The four Gospels can be considered biographies. While they were being written Paul was already at work. Awesome, awesome, awesome! Thanks Anthony! I will quote you in my sermon this Easter Sunday! God bless! I enjoyed reading your blog. Having researched this for a book I was writing I came to a somewhat different conclusion. It’s all speculation so this is just for fun. Most likely what was meant by a guard was a “contubernia”, a group of eight soldiers that typically billeted together in the field. For example a roman tent (also called a contubernia) was divided into eight parts and divided among the men who slept in it. So, on an overnight bivouac, minimum eight men. I do not think Pilate would have feared a bunch of locals and sent more than that – besides, it would not look good to send a bunch of soldiers to stand guard over a dead prisoner. Further, I don’t think the High Priests would have sent their own Temple guards. This was the Sabbath (illegal to carry weapons on the Sabbath) and the guards had already proved somewhat less than reliable where Jesus was concerned. Earlier they had sent the guards to arrest Jesus in the temple, but they came back empty handed. When asked why, the guards said, “No one ever spoke like this man.” The High Priests were livid. The temple guard also had limited authority to act. They could only use lethal force if the security of the temple or the nation itself was threatened. Pilate had tried to delegate that authority to the Jewish leaders but they had refused – saying that it was unlawful that they should do so. The word “unlawful” is in the sense of being a regulation of heaven and not that of man. As a former Centurion that is my two cisterci worth. Thanks for the comments, Silvanus. It’s possible that the purpose of the guard was only to establish custody, as it were. That is, to establish whether or not an attempt to steal the body actually occurred. Theoretically, only one or two guards could accomplish that. Even 8 is better than 2, but I think the line of argument (eg, ‘fearing a bunch of locals to guard a dead man’) understates the situation, considerably. In some of the linked essays, I flesh out some of the underlying dynamics that I think strongly argue for more. Such as: 1., the Jewish threat to report Pilate to Rome, 2., the genuine possibility that a missing body could start a bloody revolution, blame to be laid at Pilate’s feet and, while I don’t know if I mentioned this, 3., the very real possibility that some actually believed Jesus may have had the power to pull off a resurrection. This last may seem odd, but remember that in the Toledoth Yeshu, Jesus’ supernatural powers are not disputed. Only their source. And that’s from a hostile source! Likewise with the Temple guard situation. I don’t put much stock in the idea that the illegality to take along weapons or use lethal force played much consideration. There is no hint of this hesitancy when it came time to stone Stephen, for example. But more relevantly, the Jewish leaders had already violated the law quite a bit in Jesus’ trial. Eg, having a trial in the dead of night, convicting without agreeing witnesses, and so on. Apparently, the circumstances were such that they were willing to bend what was ‘lawful’ quite a bit, and I don’t see how those circumstances changed that much between Jesus’ death and his burial. Not disputing, of course, that they very much wanted to portray their acts as lawful, in order to justify themselves. They, too, were keen not to have a revolution fall upon their heads, whether from outraged Jewish followers of Jesus, or from Romans putting down that revolution. (A legitimate fear, as history after this shows us). But perhaps the strongest ‘speculative’ argument that perhaps can be raised against all arguments that hold for fewer hostile folks at the tomb is the fact that the ‘stolen body’ story occurred IMMEDIATELY (Matthew records it, and Justin the Martyr a few decades later states that it is still in currency) and yet no one seemed to believe the story! It isn’t just that the story assumes a missing body, but that no one seemed to really believe that the disciples could have stolen it, and that furthermore, there were factors in place as to make a stolen body HARDER to believe than a resurrection. And if you think about that, then whatever was placed at that tomb must have been such that the fact the body was still found to be missing must have just been shocking. I don’t know if you can cultivate that kind of shock… the kind of shock that sends a religion into a meteoric rise from the very location it could have been most easily be refuted… unless it was well and widely known that the people most interested in refuting the resurrection tried and utterly failed. The Gospel of Matthew clearly says that only “some” of the guards went to city and met with the Jewish high priests, and were offered the bribe money. Not all. I would propose that those who fell as dead men upon seeing the angel did not go to the Jewish high priests, and would not have accepted a bribe.